Summing the spins of the three quarks that make up the proton seems, in principle, straightforward, however, physicists have been faced with a particularly stubborn imbalance. In 1988 the European Muon Collaboration (EMC) at CERN shocked the physics community by announcing that the sum of the spins of the three quarks that make up the proton is much less than the spin of the proton itself. This discovery questioned the fundamental idea in physics that the amount of any physical quantity on one side of an equation must equal that on the other side. EMC researchers discovered that the net spin of the three quarks actually accounted for no more than 24% of the proton's spin and may even contribute as little as 4% – in other words, practically none. This discovery sparked the beginning of the "spin crisis". Gerhard Mallot, a senior physicist at CERN, recalls how nervous people were and how there were conjectures that the experiment was flawed or even that the underlying theory, known as quantum chromodynamics (QCD), might not be correct. 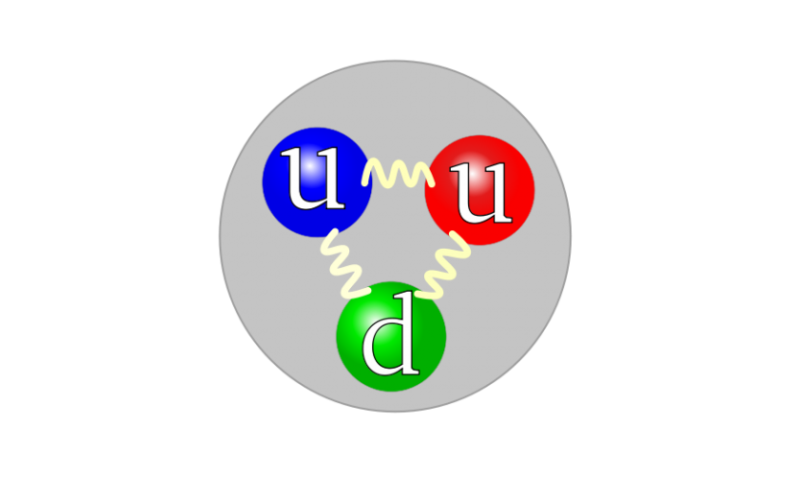 Further scattering experiments at the Stanford Linear Accelerator Center (SLAC), CERN and the DESY laboratory in Germany eventually confirmed that quark spin contributes 30% (+/-5%) of the total proton spin, but that still leaves 65–70% unaccounted for. In the June 2015 issue of Physics World, science writer Edwin Cartlidge describes how researchers have since devoted their energy to finding alternative possible sources of the proton spin, such as the momenta that quarks and gluons – particles that mediate the strong nuclear force by bonding together quarks of various types – acquire as they rotate around the proton's spin axis, or perhaps the spin of the gluons themselves. The hot debate between theorists is just how much each of these components contributes to the overall proton spin, and the latest round of data from the Relativistic Heavy Ion Collider (RHIC) at the Brookhaven National Laboratory on Long Island in New York suggests that gluon spin may be the chief culprit. Werner Vogelsang, a theorist at the University of Tubingen in Germany, says that these results pinning down the gluon spin contribution to 40% have lifted the "crisis mood" surrounding the hunt for the missing spin. With these confident estimates in, one might expect that only a third of the proton's spin remains up for grabs. However, some physicists believe that the spin problem is far from being solved and are calling for a new machine, the Electron–Ion Collider (EIC), which would combine the punch of proton-beam experiments with the precision of electrons and reach collision energies in the region of 140 GeV. Vogelsang points out that more data are needed to settle the issue and adds that "The only thing to do is push experiments down to these scales and see what happens there. There might still be surprises lurking." It is a fair bet that if physicists can solve the spin problem they will have made progress on the mass problem as well. What problem? A proton is a helical loop of charge. The self repulsion and magnetic pinch of the charge causes spin. The rotating charge cause a magnetic moment perpendicular to the spin. The mass is apparent only. Mass is the resonant angular momentum. And so is the inertia. The simple reason for energy steps is because angular momentum can only resonate at certain diameters or radii. What's so hard about that. Modern science is kindergarten science. You will not find answers there. "This discovery questioned the fundamental idea in physics that the amount of any physical quantity on one side of an equation must equal that on the other side." Wow. And here I was thinking that the quantities on both sides of an equation are equal by definition. The real question is why is the proton spin always +- 1/2: When the three quarks can have unrelated +- spin directions not some simple classical additive fractional relationship. Its behaving more like a normalisation phenomena; its always exactly 1/2 and we don't know why. So a rotating electron has nothing to do with it? Or magnetic fields? Or circular polarized waves? Or if your head is spinning? quarks emit/absorb gluons = 35% ? "Are scientists finally on the brink of understanding where proton spin comes from?" Nope. well done, another informative physorg article. Im no physicist but i seem to recall that the protons have a similiar problem with the mass of its components vs the mass of the whole. Hell of a coincidence if you ask (the lacking higher knowledge) Me. This will also still allow for the seemingly 'random' (but not truly random) quantum dynamics that occur within this QCD lattice universe, in which photons are the excitation-inducing medium, and the systemic function is resemblant of a warm beer in an ice chest, a form of quantum thermodynamics displayed in a figurative example in which the only observer alive ever looks at the "quantum" of a currently observed situation (1), but in which that "quantum" is immediately dissipated, but not entirely, as the observer shifts their observation about-face to a completely different situation (2). The "quantum" has dissipated immediately, but not entirely, away from situation (1); but the 'not entirely' aspect comes from the quantum template storage of situation (1) in the observers mind/hippocampus (Penrose) - allowing us to revert back to situation (1) with the accompanying quantum shift and it still remain the same without any trace that it had left in the first place.